Madama Butterfly starts with Goro, showing Pinkerton the house he’s rented and demonstrating all the shoji screens. (“Where’s the bridal chamber?” asks Pinkerton. “Here or there, it depends,” answers Goro, prophetically.) So we’ll start meeting our Butterfly cast with tenor Doug Jones, who returns to our stage, and to this wonderful role, which he also sang in Seattle Opera’s last production of Madama Butterfly in 2002. Doug, last season we saw you as Monostatos, and now Goro...in your career you get to play lots of evil characters. Not so many! But some. Where do you rank Goro, in terms of wickedness? 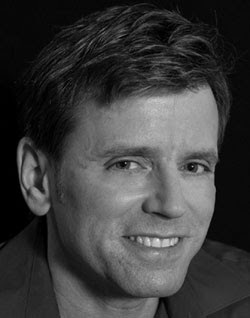 Is this “marriage broker” (you might also call him a pimp) the most evil character you play? Nah. He’s neither/nor. He’s an opportunist. What happens in this opera isn’t his fault. I mean, it is, but it isn’t. Who’s more culpable, Pinkerton or Goro? Goro maybe should know better, but Pinkerton has no idea. I remember last year your Monostatos was like Alberich, we understood how he’d gotten to be this depraved figure. Right, and Goro is just trying to make a buck! Sure, he’s going to try and come back and sell her again, for lots of money, and all her sisters and her nieces. And get Sharpless as a customer. 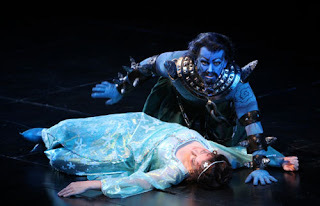 Christine Brandes (Pamina) and Doug Jones (Monostatos) in Seattle Opera's 2011 production of The Magic Flute. It was a different culture, and I suppose either you accept it or you don’t. Nobody is forcing her to get married. That’s the problem! Nobody can force her to get married. Is Goro well-connected in the geisha world? Oh, yes, those are the best ones to offer up as brides. They’re the ones the sailors want. What happens to Goro after the events of this opera? No, scotch. He’s adapted to Western fire-water. And he probably smokes. He’s probably gonna have a heart attack in about five years time and die. Does he even figure out what happens to Butterfly? You’re not in Act Three. Ah, but his spies. He has fingers in every pie. We were talking about that the other day in rehearsal: does he know about the letter Pinkerton sent Sharpless? Why do Sharpless and I arrive at Butterfly’s house at the same time, in Act Two? Am I stage-managing that so that Sharpless will see she has a good option, in Yamadori, and will try to convince her to marry him? 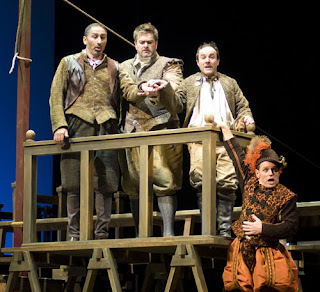 Ashraf Sewailam (Pistol), Weston Hurt (Ford), Steven Goldstein (Bardolph), and Doug Jones (Dr. Caius) in Seattle Opera's 2010 Falstaff. That’s right, Sharpless says to her, afterwards, “Butterfly, I think you should marry that rich Yamadori!” Say, who’s been paying the rent on Butterfly’s house these past three years? The libretto doesn’t say. We think it might be Sharpless. Tell us what you remember about Seattle Opera’s previous Butterfly production. The rake was so steep! I remember asking for ski poles, because it seemed like a very sharp slope to me. That was the first show in the Mercer Arena, and our dressing rooms...well, let’s just say it was a different situation, with curtains instead of doors...it was fine. I remember my hair was dyed dark black and spikey. 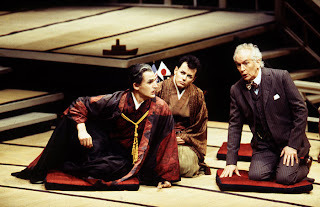 Morgan Smith (Yamadori), Doug Jones (Goro), and Richard Stilwell (Sharpless) in Seattle Opera's 2002 Madama Butterfly. How many times have you done this opera? This is my fifth. The first was in Belfast, and we did the Brescia edition, with the longer Act One. You know, with Butterfly’s drunken Uncle Yakuside and all that. There’s more music, it goes on for a while. I’ve never done it since...I understand why people prefer to not do that version. I’ve done it in Austin, and in Hawaii. And now twice in Seattle. No!!! We rehearse till 1, and then you go and eat a lot of great sushi. Are you a Puccini fan? Yes, we know all his tricks, we know the music and what’s gonna happen, but still it’s hard not to be moved! What’s your favorite Puccini opera? Turandot, because the silly tenors have the most prettiest music they will ever get to sing. [Demonstrates]: “Addio amore, addio razza...” There are some wonderfully sentimental moments for Ping, Pang, and Pong, in their big scene, reflecting on the lives they’ve left behind, and wondering wouldn’t they like to go back to those earlier quiet, peaceful lives. They have a moment of real honest reflection. I honestly don’t think they would want to retire—they like being in the center of power too much—but what pretty music they sing there. Doug Jones (Beppe) and Nuccia Focile (Nedda) in Seattle Opera's 2008 Pagliacci. [Quotes a line of Goro’s, sung on a monotone]: “C’è. Entrate.” Doesn’t send your pulse racing! Yes, he’s got that little arietta. But Turandot, they’ve got the best music. And it’s a great opera!